Lactofermentation is a chemistry experiment, or if you like, an artistic exploration into decay. Fruit or vegetables (generally) are placed into salted and perhaps sweetened water – or in the case of sauerkraut, dry-salted, the cabbage itself providing the required liquid – and left for some time, the exact recipe varying with ingredient, temperature, season. The amount of salt is important – you need enough to kill off any rogue yeasts, and the majority of bacteria, but not so much as to see off the lactobacilli, which will, given time, eat their way through natural and added sugars, creating lactic acid – after the manner of acids, a preservative – in return. This is one of those extremely useful processes, symbiotic between humanity and microscopic life, which form the foundations of our culinary history – and one of the more baffling ones. You can see how some sour grape juice was sampled, liked, and polished off; how old dough was found to swell fuller in the oven’s heat. To leave cucumbers entirely immersed in salt water for a period of time takes a certain amount of idle curiosity. However. To get back to those pickles, perhaps it’s the decay that puts us off; we don’t like to watch the cloudy, mysterious bubbling as the bacteria do their work. As I’ve mentioned before, we’ve never had much truck, historically speaking, with sourdough bread either, or, our noble cheese aside, soured milk products. It’s a shame, anyway, as fermentation is an excellent method of pickling, preserving (haha!) as it does a lot of characteristics normally masked by heavy, sweet vinegars. I fermented some tomatoes recently, to an (I think) Ukrainian recipe via Olia Hercules, and they were delicious. Sour almost to the point of fizziness, they nonetheless taste of tomato – and of different varieties of tomato – in a way which chutneys and ketchups, however tasty, do not. It’s odd, when British cooking has such a reputation for plainness (simply boiled or roast meat, potatoes, vegetables) that in pickling we frequently pile on so much ornamentation, to the point where it overpowers the content – we don’t eat piccalilli for the beans and cauliflower, or Branston pickle for the whatever-they-put-in-Branston-pickle – although the same could be said of our charcuterie tradition. All across Europe, people dry-cure whole or boned pork legs in masses of salt, trusting in the quality of the animal, fed on acorns or herbs or common swill, to shine through; we, on the other hand, immerse the same in treacle, beer, sugar, cloves, marmalade, vinegar, saltpetre, peppercorns, herbs and hay, roast it, and still serve it with nose-tickling mustard, pickles, pickle, and piccalilli. We have a thousand sausages, but no salami – salt beef but no cecina. You could blame the climate, but I’m not convinced. I stuck a salted sheep’s leg up a chimney all through summer and it came out fine. I think it’s that same fear of rot, of seeing the white bloom of mould creep across the skin; deep in a Puritan part of our souls we are scared of decay – although that doesn’t account for Stilton or, for that matter, Stichelton. If you take a clear, well made, lightly gelatinous fish stock, season it with salt and sweet white vinegar and infuse it with lovage, mint and celery leaves, the result is a clean soup – a bone broth, if you must – which sits happily in the sometimes awkward period between summer salads and the dense potages of winter, although it might seem a little austere. Add some diced golden and orange tomatoes and gently warm through until the jelly round the seeds seeps out into the pan, then spoon the lot into a plain white bowl, where it will glow with brisk, late summer health. You might have started the bowl with some flakes of salt-baked gurnard, poached, shredded skate wing, or a lightly cured mackerel fillet, barely cooked through in a little spare broth; you might finish it with a fistful of chopped dill, fennel tops and parsley or a spoonful of a pungent, quivering aioli. This is a way of cooking, precise and simple, that can only proceed from abundance, and as such is incredibly irritating to read about. No-one wants to hear about your well-stocked larder, your fridge full of home-made condiments and seasonings – I’m sorry for bringing it up. In my defence, ours is professionally so, with space to spare in cupboard, freezer, and dishwasher, and the time, inclination and imperative to do the kind of housekeeping, the straining, simmering, bottling, pressing, potting and drying which formed the backbone of our imaginary peasant cuisines; outside of work, it’s a fantasy, but one that it’s nice to inhabit for a while. I don’t think I’ve ever made fish stock at home. 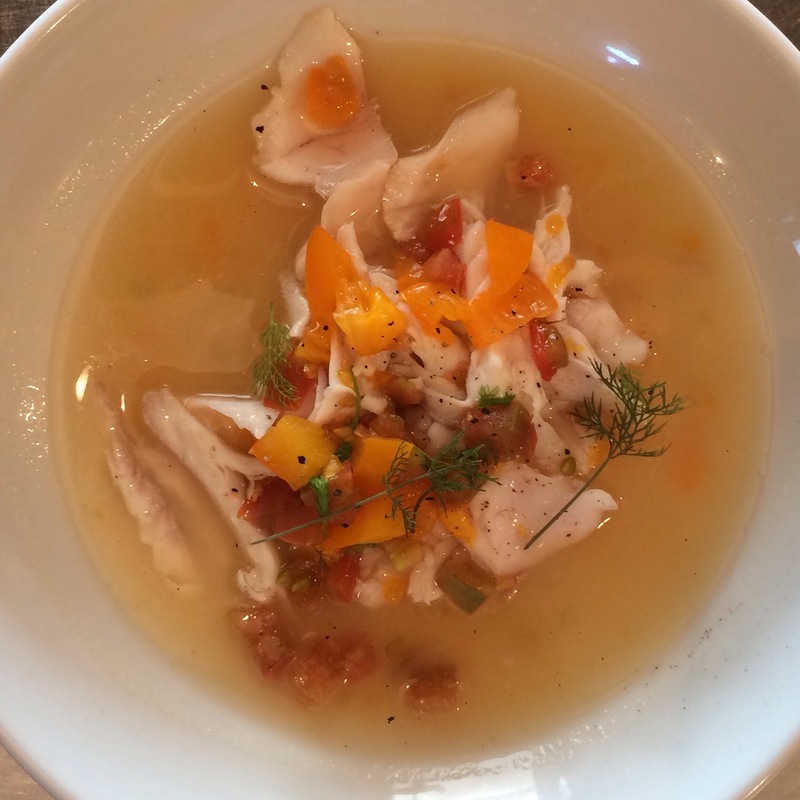 Meat broths can be thrown together out of ham bones or roast chicken carcasses, a few scraps of veg, simmered for hours with little attention, but fish needs a bit more care. If you wanted to follow the non-recipe above, taking the mackerel option, then you’d need to start with another fish entirely. The bones of oily fish do not make a good stock. You want white fish carcasses (flatfish are good), which you’d need to ask your fishmonger for, if you have one and he likes you, or save from a previous meal of, say, fat bream you’ve filleted yourself – which brings us back into the realms of fantasy. I don’t think I’ve ever filleted bream at home either – I roast them whole, and the roast bones do not make a good stock. Cheap white fish fillets will do. Put them, or the bones, in a pan with onion, fennel, celery, peppercorns, bay – you know, all the standard stock accoutrements you have lying around your well-stocked pantry. Cover with water and bring to a bare simmer, which is where it should stay for about half an hour. “There was silence throughout heaven for about half an hour” – that’s when they were making fish stock, carefully watching the bubbles to ensure it never broke out into anything as frantic as a putter. I assume so, anyway. When it’s ready, you can lift out all the bits with a sieve and pour the clear liquid into a bowl or tub containing lovage, if you can find it, mint and celery, leaving behind any fishy sediment. Lovage is an excellent herb, something like an intensely astringent celery, which I have never seen for sale anywhere, although it grows in this country fierce and strong. You can leave all that to infuse like some unpleasant, medicinal tea, before straining and, if you like, freezing the result. If you do the latter, then take the opportunity to clarify it upon defrosting – it’s an extremely easy process, but one I can’t be bothered to explain here; just writing all that about stock has exhausted me. Google, google, google. Time to cure the mackerel, if you’re still with me. You need ridiculously fresh fish for this. Red gills, bright eyes, rigor mortis, the works. You’ll probably need to find it whole, to ensure freshness, and then fillet and pin-bone it as quickly as possible. The flesh of oily fish degrades incredibly quickly. I generally put the fillets in a tub, floating in an ice-bath, then put the lot in the fridge and make the cure. Equal parts salt and sugar, some crushed fennel and coriander seed; mix together and spread out in a tray. Pin-bone the fish with your fish tweezers and place the fillets, flesh side down, in the cure. Put back in the fridge for half an hour, then wash the cure off and do any necessary trimming. A faff, yes, but it really helps to keep them in the first freshness – and as we know, there is no second freshness. Blitz the first three in a food processor or whisk together in a bowl. Slowly add pomace oil until it goes really thick. You DON’T have to do this in a constant stream, but it does have to be gradual. When it looks a bit too thick, mix in the lemon juice. Slowly add the olive oil until it looks and tastes right. That was easy, wasn’t it? It used to be thought that standing wine was turned into vinegar by vinegar flies; or perhaps it was that these little insects were bred spontaneously out of vinegar, or maybe both, at different times – I don’t remember when or where I read this fact, these facts. Leave a cup of vinegar uncovered for an hour or two, anyway, and you’ll see why this possibly fictional belief persisted – flies you never knew were there will have suicided within it. I don’t know why they do this. 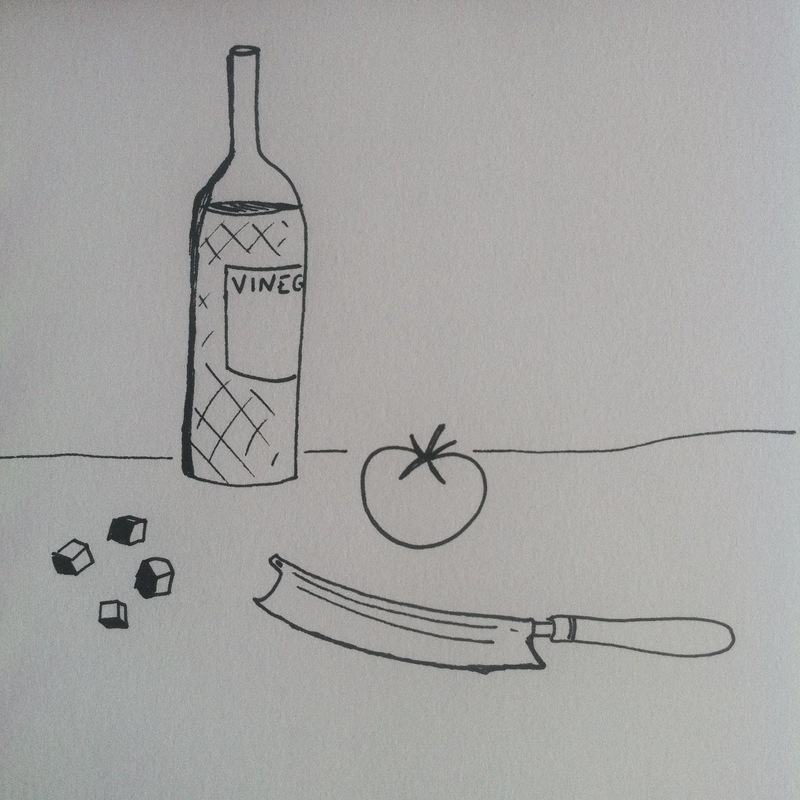 We now know, of course, that wine (or beer, cider, or fruit wine) is turned into vinegar by a helpful bacterium, the acetobacter, which – as far as I understand the matter (about as far as I could throw a gallon of barrel-aged sweet Modena) – consumes alcohol and pisses acid; vinegar-making is a process of controlled decay, whereby leftovers, left to rot, turn eventually into a preservative, without which British cuisine would be particularly bereft. The cured items, tracklements, chutneys, ketchups and sauces with which our food is scattered – roll-mops, pickled onions, pickled red cabbage, brown sauce, mint sauce, Branston, and so on – all rely heavily on the clanging collision of sugar and vinegar, with little recourse to simple salting and lactofermentation, as is found in other pickle-heavy cultures (Germany, Turkey, the US); and where would the chip-shop be without vinegar? My brother, who has always had a love of extreme tastes, used to use malt vinegar, or possibly non-brewed condiment, as a universal seasoning, for which he was roundly mocked, and rightly so; pasta doesn’t need to be drowned in it. Still, he was on to something. A splash of vinegar works wonders on a long-cooked stew, revivifying what was lost in the murk; the magic that chilli sauce works on simply cooked eggs comes as much from the vinegar as from the heat, that welcome touch of sweet and sour. To my mind, seasoning a dish – that final adjustment, as it’s often called in recipes – means not just intensifying our apprehension of flavour with salt, but a balancing of all the basic tastes on the tongue. To a simple tomato sauce, already rich in umami, we might add a pinch of sugar, a little lemon juice or vinegar; bitterness comes from pepper and olive oil, which also contributes the pleasing taste of rich fats. Come to think of it, forget that tomato sauce – make a salad dressing, one with a little anchovy in it, designed to perk up gentle, buttery salad leaves. Dissolve sugar and salt in good vinegar, add pounded garlic and anchovy, whisk in grassy oil – you have sweetness, salt, a sour kick, heat and deep savour, and a cleansing, fatty bitterness – you have, in other words, a powerful hit of all tastes, which is why (some) salad dressings are so delicious to drink by themselves. Taste, as distinct from aroma, is a real bodily pleasure that puts you firmly in the present. On the other hand, we are told – we know – that smell is the sense most hard-wired into our memories, to the point where it might have been designed for the express purpose of recollection. Everyone must have had that feeling when, walking along entirely in the here-and-now, you smell an ex-girlfriend’s perfume, or the sweet, submerged scent of chervil and jump back five or fifteen years into the past, which slices through the present like a good knife through sweating fat. Flavour, then, although we experience it as one thing, is a combination of two very different sensations which dance around each other like two pigeons on a tiled roof, tending first one way and then the other, hopefully, in the end, to meet somewhere in the middle. The goal is that the taste lives up to the promises made by the first drifting smells. his can be particularly hard to achieve when the smell is one happily remembered from childhood, which is why the trend for house-made ketchups, baked beans and so on can be such a minefield – they have such intense early sense-memories to live up to that they must nearly always fall short. The goal is that the opposite happens; that the new, fresher version retroactively transforms your childhood meals, making them seem daring, original and tantalising, in the same way that the most innocuous 50s ballad becomes, after its use in a David Lynch movie, haunting, rich and strange. I don’t know if this version of brown sauce achieves this universally, but it does for me. HP sauce is a fine thing, the perfect foil to a heavy full English, and a good riposte to anyone who would insult the national palate; how can a country where a spiced date and tamarind sauce is eaten with dry-cured pork as a breakfast item be accused of dullness of cuisine? This makes rather a lot, but it seems to keep indefinitely (sugar and vinegar there) in the fridge. You could bottle it properly if that’s your thing. It goes extremely well with black pudding, as well as bringing the bacon sandwich one step closer to perfection. Tie up the spices in a little bag or resign yourself to sudden breakfast crunches. Put everything in a big pan, bring to a simmer, and let it putter for two or three hours until soft, cooked and dark. It’ll need some attention to stop it sticking. Remove the spice bag and blend smooth in batches, adding an optional dash of sherry vinegar to each batch (it perks it up a little). Bottle or fridge, and leave for a week to get to know itself. Apply liberally to cured pork items.